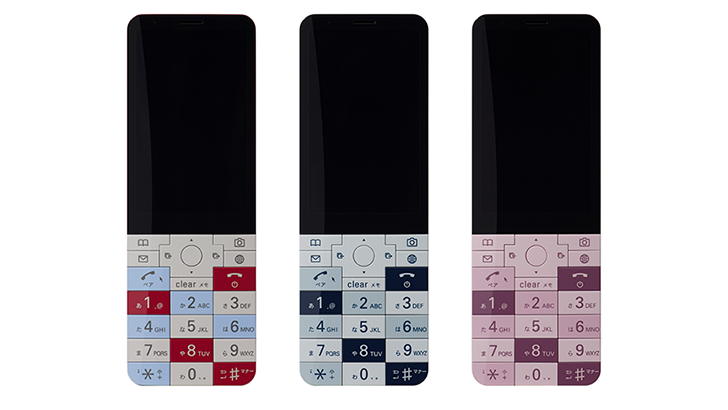 This fall will mark the 15th anniversary of the original INFOBAR feature phone in Japan, and telecoms corporation KDDI is releasing a new edition of the device to celebrate. The INFOBAR xv will be the third in this series, and it's by far the most striking of the bunch. And sure, it will run a very short list of Android apps, but let's be honest — this is more about indulging our eyes than anything else, because this feature phone is a stunner. The INFOBAR xv, which follows up on the INFOBAR 2 released in December 2007, is born of KDDI's au Design project, which aims to bring fan-friendly concepts to fruition. Its latest creation has a 3.1" WVGA LCD display with a black bezel, but the sleek, curved body of the phone itself is frameless. The physical keys retain the series' classic layout and colorful pattern. Yeah, it's a pretty phone. 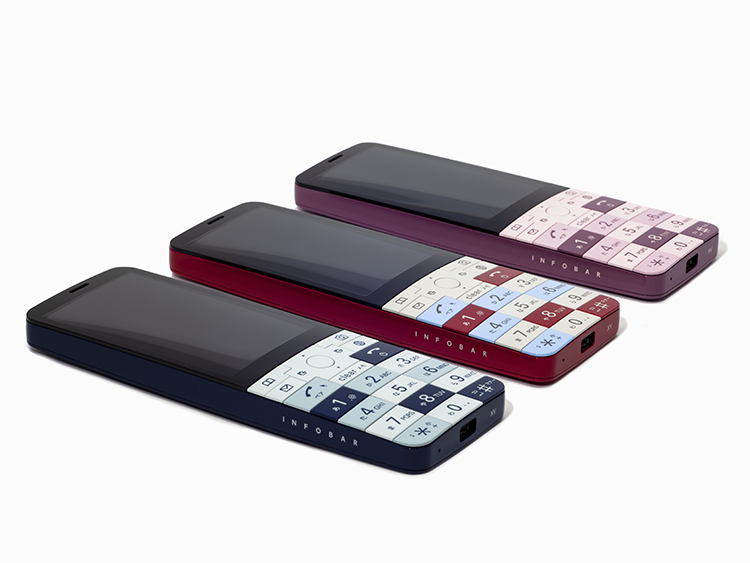 The INFOBAR xv, slated for an October release only in Japan, will be offered in three colors: the classic Nishikigoi, Nasukon (eggplant), and Cherry Berry. 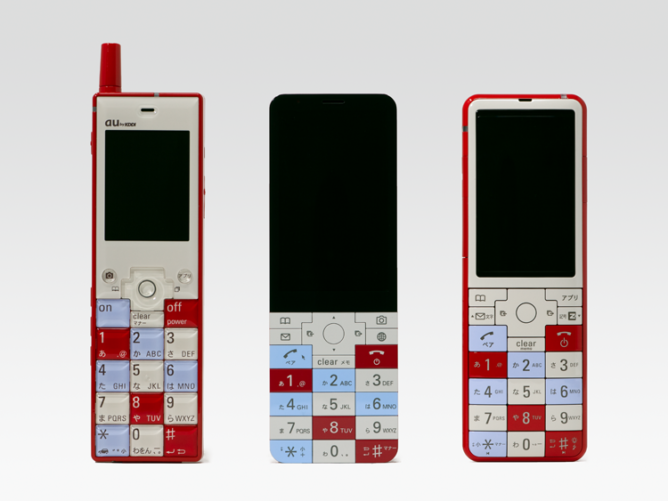 The feature phone will have some sort of slimmed-down Android compatibility, with support for two messaging apps: the popular LINE and "+ message" (supported by three carriers in the country). However, the phone won't have access to the Play Store. The INFOBAR xv is 48mm x 138mm x 14mm (or about 1.9" x 5.4" x 0.6"), though the weight is unlisted for the time being. The phone also has an 8MP rear camera, a 1,500mAh battery, expandable microSDHC storage (up to 32GB), LTE, Wi-Fi, and tethering capability. It will have a "smart voice assistant calling function," which appears to be something along the lines of a Siri or Google Assistant. A desktop holder, which will be bundled with the phone, turns the device into a clock while it's recharging. The price is to be announced. Feature phones may be out of fashion in many markets, but there's still an undercurrent of innovation and interest here. A few weeks ago, Google invested $22 million in KaiOS, an operating system for feature phones, including the nostalgia-inducing Nokia 8810 4G. Perhaps there's more of a bridge to build between dumber and smarter phones.